It's the most wonderful time of the year! And we'd like to make it even more wonderful by sharing our favorite gifts by Chicago movers, shakers, and makers--our Forth alum. Scroll through our gift guide to find presents that will delight the people you care about most. The Production Mode line is designed by labor activist and fashion designer Jamie Hayes. The fall/winter 2015 line consists of structural, yet feminine pieces made of eco-friendly, vegetable tanned leather from Chicago tannery Horween, and includes an exclusive hand screen print designed by artist Paula J. Wilson. All the work is cut and sewn at our studio in Chicago's Logan Square neighborhood, where all employees are paid a living wage. We love: the Black Vegetable Tanned Leather Jacket. Whether you pair it with a LBD or your favorite pair of jeans, you're sure to look like a rock star. For your friend who is always prepared: the Vegetable Tanned Leather Coin Purse. Grab one for yourself and one for a friend. These are just the right size for storing life's necessities. You'll be prepared to go wherever adventure takes you! Argaman and Defiance owner Lydia Crespo was born to design with silks. In fact, her name means "the maker of purple cloth." Lydia lives into her destiny through Argaman and Defiance. Her collection is filled with blouses, scarves, and wraps--all made with the most luxurious silks. For the social butterfly: the Wine Bottle Wrap, sold individually and in sets of 6, 12, and 24. Wrap your hostess gifts in style. Indoor gardening is a breeze with Modern Sprout (No green thumb required!) Co-founded by Forth alum Sarah Burrows, Modern Sprout harnesses hydroponic technology to make growing herbs and bulbs at home accessible for everyone. We love: the Amaryllis Winter Bulb kit. We like to think of this kit as hope in a jar because there's nothing like watching a flower bloom to remind you that warmer days are coming! Le Papier Studio is the product of Forth alum Vana Chupp's desire to document her memories of her son and husband. The brand offers silhouetted art prints, pillows, and jewelry designed to surround you with happy remembrances of the ones you love most. We love: the Laser Cut Silhouette Cuff. A modern take on the charm bracelet, this cuff keeps your loved ones close and allows you to look effortlessly chic while doing it. Honey Butter Fried Chicken offers comfort food without compromise. Christine Cikowski, Executive Chef and Forth alum, promises each and every guest humanely raised chicken and a spectacular customer service experience. And we had to mention that Honey Butter Fried Chicken cares about the environment too! We love: Honey Butter Bucks. Nothing warms the soul and puts a smile on your face like fried chicken. 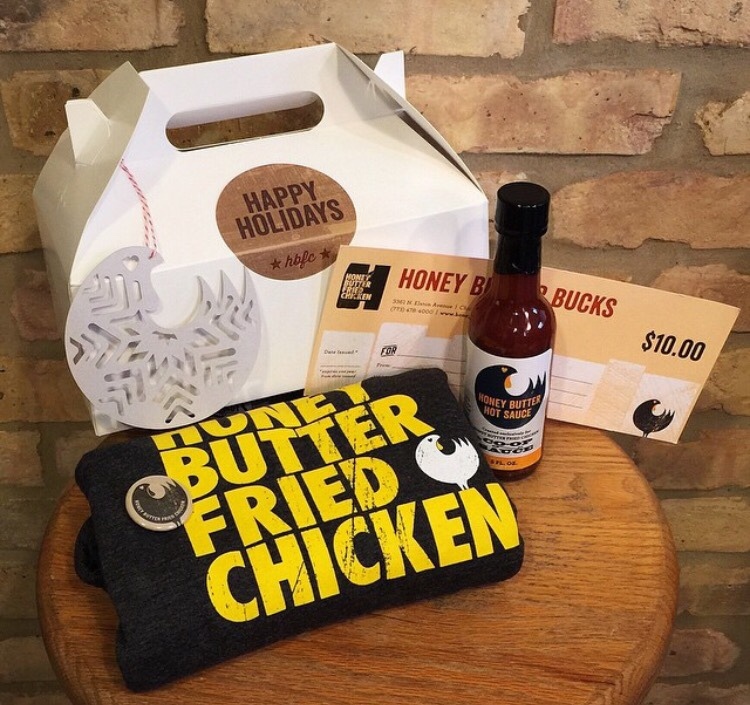 Pick up gift certificates--a.k.a Honey Butter Bucks, t-shirts, hot sauce, koozies, and more from Honey Butter Fried Chicken. Slow Food Chicago is a non-profit organization dedicated to changing the way we eat, for good. Their goal is to transform local food systems so that our food is "good, clean, and fair." Slow Food Chicago is fearlessly led by Forth alum, Cortney Ahern. For your friend who is always at the farmer's market: a Slow Food membership. When you give a membership to Slow Food, you'll help support local chapters making a difference in their community, protect food biodiversity, contribute to school gardens, and more! BANGTEL is a design and hospitality company. Staycation in style or step up your home decor game. Owner and Forth alum Liz Klafeta even sells a few of her favorite items for making a home more bangin' on the BANGTEL website. We love: Nana Creme. Indulgent taste without the side effects of over-indulging. It comes in a variety of flavors, so everyone can enjoy. For your friend who is not a morning person: the F@#* This cup. This tumbler tells it like it is. Might we suggest pairing this gift with a bag of strong coffee? The Fourneau Bread Oven is the brain child of Strand Design co-owner and Forth member, Sharon Burdett. Intuitive and beautifully designed, making fresh bread has never been easier. Maya Mueble is a furniture and textile company with heart. Emily Prendergast, co-founder and Forth member, believes that business can and should be a force for good. Maya Mueble partners with artisans in Guatemala and El Salvador to deliver one-of-a-kind home decor pieces. Customers get gorgeous pieces for their homes. The aristans gain meaningful and empowering work. Everyone wins. We love: the Momo Wool Blanket in grey. Make your space feel more home-y with this cozy blanket. It's the perfect partner in crime for a lazy Saturday. For your friend who is always cold: the Manta Blanket in black and white. Add an extra layer of warmth (and style!) with this blanket. Guaranteed to warm both your feet and your heart. Wink Design Atelier is the design studio of Forth alum Brenda Rotheiser Bergen. Wink's works include everything from packaging to branding to advertising. Here at Forth, we can't stop looking at the books that Brenda has designed! We love: Air. This books features Vincent Laforet's aerial photography. You'll see ten iconic cities as you've never seen them before. Place it on your coffee table. It's sure to spark conversation. For your music buff friend: Gifted- The Instruments of Ed Stilley. Ed Stilley believes in the power of music. He's dedicated his life to creating instruments from available materials and gifting them to children. This book documents Ed's artistry and the people who have been touched by his art.